During the past year and a half that I have been positively passionate about Portland, I have had a wonderful time discovering Portland pho­tographically, as well as learning about the history of this city and the surrounding area. During my research I came across references to the intriguing-sounding Alphabet District. But before it was even on my radar, I had unknowingly visited it during a photo outing to Port­land’s NW 21st and 23rd Avenues. Before I tell you about my outing, let’s take a brief look at how the Alphabet District was created. As I explained in my Hiking Burnside Street Between Portland’s City Limits article, Burnside Street is a major thor­ough­fare and one of a few east-​west streets that runs un­in­ter­rupt­ed on both sides of the Wil­lam­ette River. It serves as the dividing line be­tween north Portland and south Portland. The first plat of the fledgling town was initiated by Portland co-founders Asa Lovejoy and Francis Pettygrove in 1845. It consisted of about 16 acres just west of the Willamette River and just south of today’s Burnside Street, in the upper-​right corner of the green-shaded South­west quadrant shown on the map. The same year, John Couch took a claim on a square mile of land just north of Burnside, bordered by the Willamette on the east and north, and on the west by what is known today as NW 23rd Ave­nue. When Portland was incorporated in 1851, the city boundaries included this “Couch’s Addition” — i.e., an addition to the the original 1845 plat. It oc­cu­pied much of the orange Northwest quadrant on the above map. 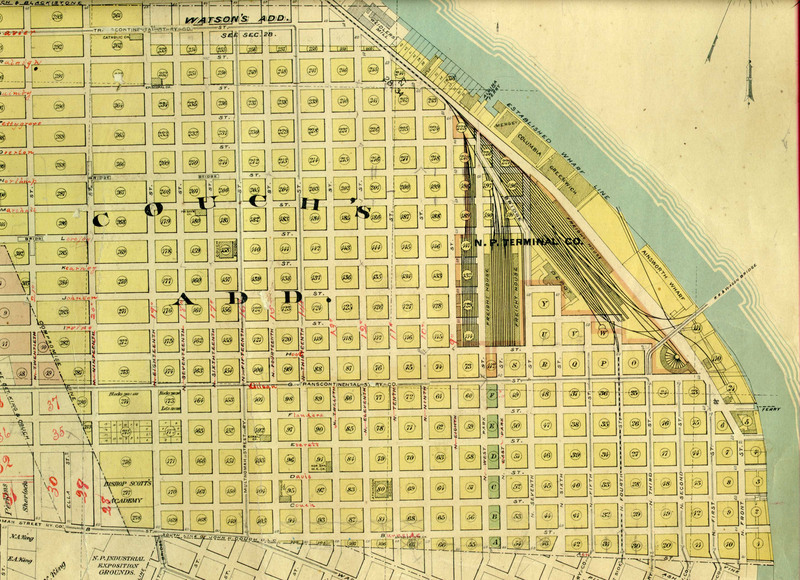 In 1865 Couch platted his first sub­di­vi­sion, with each street indicated by a let­ter of the alphabet. Thus the now-​his­tor­ic Alphabet District was born. During the Portland Street Renaming of 1891, these “letters of the alphabet” street names were replaced by actual names (mostly of Portland pioneers) starting with the same letter. So, for ex­am­ple, ‘B’ Street became Burnside Street, ‘C’ Street became Couch Street, and so forth. By clicking on the yellow map above, you can see a much larger edition which shows the renaming of the streets in Couch’s Addition. Fast-forward to our modern times ... Couch‘s Addition has been divided into two sections, with Interstate 405 serving as the line of demarcation. To the east, nearer the river, is the Pearl District. On the west side of I-405 is the Northwest District — a good third of which, in the southeast part, is officially known as the Alphabet District. Even though all of the street names be­gin­ning with ‘B’ through ‘S’ exist in the Pearl District as well as the Alphabet District, because of the curve of the Wil­lamette River, and because of the angle of the streets south of Burnside, the ‘A’ street is missing in most of the Pearl District (except for a few blocks of An­ke­ny Street closer to the river), and street names beginning with ‘T’ through ‘Z’ are absent as well. In addition, although the Pearl District has these Alphabet street names, it is not considered to be part of the official Alphabet District. For my ramble through the Alphabet District, I wanted to pass by all twenty-​six streets, from A to Z. I had to decide which north-​south avenue to walk along that would make this goal the easiest to achieve. It might seem that I should choose 23rd Avenue, because that is the most famous street in the District. How­ever, because of the angle of Burnside Street (it is not aligned exactly east-​west), the next street on 23rd north of Burnside is Everett. Couch and Davis Streets are completely missing! That for sure would not work! In addition, there is no street starting with ‘A’ just south of Burnside at 23rd. Because there was no single north-​south avenue that met my requirements, I was forced to route my walk along two dif­fer­ent streets. At the southern end, I started at the three-​road intersection of SW Alder Street, West Burnside Street, and SW 19th Avenue. I strolled north on 19th for exactly one mile until I came to Vaughn Street. Because 19th Avenue does not continue on to another cross street past Vaughn, I walked two long blocks west on Vaughn so I could con­tin­ue north on NW 21st Avenue and finish the alphabet. On almost all of my more-​than-​one-​hundred photo outings all over Oregon and throughout Portland, I simply take pictures when and where I feel like it. During any particular excursion, I might walk blocks before something catches my eye and I point my camera at it. But this Alphabet District outing was different. Because I wanted to document all 26 letters of the alphabet, it was im­per­a­tive that I take photos on each block. That meant finding a photo-​worthy sub­ject on each block, which could prove to be challenging. Even harder would be making a subject photo-​worthy even when it wasn’t. This part of Portland has long been an industrial area, although that is slowly changing. It’s not real­ly the most photogenic part of the city. At the McMenamins Zeus Café that morning, I sat there eating a delicious breakfast and wondering how hard it was going to be to meet this self-imposed challenge. The pressure was on: would I rise to the challenge, or wither under the pressure? With that truly scrumptious and sat­is­fy­ing meal under my belt, I walked a third of a mile, mostly along Alder Street, to the starting point for that day’s outing at 19th Avenue. As is often the case, I just could not resist taking some pictures along the way, before the outing of­ficial­ly began. Check out my article Of Bikes, Beauties and Bell Towers for all of the details, and to see the resulting photos. ‘A’ is for Alder, named after alder tree. The Firefighters’ Park Me­mo­ri­al is located at the intersection of SW Alder Street, West Burnside Street, and 19th Avenue. This is the only street on my Alphabet District tour that is not in the Alphabet District — but you can’t start the alphabet with ‘B’&hairsp;! It is also the only street on the tour that is south of Burnside. Some say ‘A’ is for Ankeny, but that street does not extend far enough west to reach the current Alphabet District. ‘B’ is for Burnside, named after David W. Burnside. The site of the McDonald’s on the northeast corner of Burnside and NW 19th Avenue used to be occupied by the Stadium Tavern. On the southwest corner of Burnside Street and SW 19th Avenue stands the 16-floor, 185-foot condos called The Civic. To see what used to occupy this location, check out the big building on the left in this old-time (1938) photo at Vintage Portland. ‘C’ is for Couch, named after Captain John H. Couch, one of the founders of Portland. Be sure to pronounce the name correctly, or Portlanders will know you are a foreigner — it rhymes with pooch, and not the piece of fur­ni­ture in your living room! Couch became the creator of the Alphabet District when he named the streets of his original plat with letters of the alphabet. In the photo on the left, the orange building in the background is The Morrison apartments on Burnside Street. The image on the right shows the courtyard of the historic (built 1925) Chelsea Court Apartments in the 100 block of NW 19th Avenue. ‘D’ is for Davis, named after Anthony L. Davis. Not only was he the father-in-law of David Burnside (see above), but he was also the director of Portland’s first public school, its first justice of the peace, and later on, city recorder. The 200 block of NW 19th Avenue is dom­inated by the historic (built 1904) Gothic Revival Trinity Episcopal Church. Be sure to check out this picture of more red doors. ‘E’ is for Everett, named after Colonel Edward Everett, commander of the 3rd Oregon infantry regiment, and an in­sur­ance man. The major attraction on this block is the Northwest Neighborhood Cultural Cen­ter, part of the Northwest Children’s Theater and School. This historic structure (built 1908) was originally the first Christian Science Church west of the Rocky Mountains, at 1819 NW Everett Street. ‘F’ is for Flanders, named after George H. Flanders, first mate to Captain Couch (see above) on his first sail to Oregon. He was also Couch’s brother-in-law and business partner. Occupying an entire block on NW 19th Avenue between Flanders and Glisan Streets, the impressive, historic (built 1928), Neo-Byzantine Temple Beth Israel synagogue is considered to be one of the finest examples of Byzantine-style ar­chi­tecture on the West Coast. ‘G’ is for Glisan, named after Rodney Glisan, a physician, an 1865 founding faculty member of the Willamette Uni­ver­si­ty Medical School (now OHSU), a noted author, and son-in-law of Captain Couch (see above). The 2&frac13;-acre Couch Park is located on part of what was once Couch’s land grant, which consisted of a square mile of property bordered by the Willamette River, and what today are known as West Burnside Street and NW 23rd Avenue. ‘H’ is for Hoyt, named after Richard Hoyt, a riverboat captain who arrived in 1851, and organized the short-lived Columbia Steam Navigation Company in 1857. In the back­ground is Couch Park (see above). To the right is the very nordic-looking stee­ple of the historic (built 1905) First Im­man­u­el Lutheran Church in the 600 block of NW 19th Avenue. This architecture isn’t surprising when you realize that the congregation, formed in 1879, was initially called the Scandinavian Evangelical Lutheran Church, with services held in Swedish rather than English. That language choice explains why, a year later, their name was changed to Swedish Evangelical Lutheran Immanuel Congregation. Even today there’s a Christmas service in Swedish. ‘I’ is for Irving, named after William Irving, a sea and riverboat captain, and a friend / business partner of Hoyt (see above). His donation land claim became the Irvington Neighborhood in Northeast Portland. In 1878, he sold his Oregon interests and moved to British Columbia where he built steamboats to operate on the Fraser River. On the right is the entrance to historic (built 1929) Worthington Apartments at 708 NW 19th Avenue. ‘J’ is for Johnson, named after Arthur Harrison Johnson, a butcher and land developer. A.H. Johnson’s Meat Market was an original tenant of the 1872 New Market Theater building. Above are lovely roses in front of the historic (built 1904) Bradshaw Building at 811 NW 19th Avenue. ‘K’ is for Kearney, named after Edward Smith Kearney, who was U.S. Marshal for Oregon from 1880 to 1884, and later a prominent businessman. To the right is a courtyard gateway at the recently-renovated (2013), historic (built 1930) Film Exchange Build­ing, which occupies the entire west side of NW 19th Avenue between Kearney and Lovejoy Streets. ‘L’ is for Lovejoy, named after Asa Law­rence Lovejoy, one of the co-founders of Portland, and a prominent Oregon pioneer, politician and businessman. To the right, a window box at the historic (built 1912) Altonia Apartments at 1036 NW 19th Avenue. You might be interested to know that this street name was the inspiration for Rev­er­end Lovejoy of The Simpsons, if you are into that kind of cultural relevance. ‘M’ is for Marshall, named after Captain John Marshall, who worked in river navigation for 50 years, and was a business partner of Asa Lovejoy (see above). NW 19th Avenue and Marshall Street is also the location of the best camera store in the city: Pro Photo Supply, which I have visited a number of times, and where I took my first step into a brand-new (Micro Four Thirds) world. ‘N’ is for Northrup, named after Edward J. Northrup, who was a hard­ware merchant and owned a company that built carriages and wagons. In the above photo, my photographic eye was attracted to the com­bi­na­tion of colors and shapes at the historic (built 1900) Benson Manor on the corner of NW 19th Avenue and Northrup Street. ‘O’ is for Overton, named after William Overton, one of the co-​found­ers of Portland. In 1843, when he and Asa Lovejoy (see above) claimed 640 acres in what became downtown Portland, it contained only a clearing in the forest along the Willamette River, without even a shack on it. If they could only see it today ... even a Parr Lumber store would astonish them! In the photo on the right is the in-progress 19th & Overton Apartments, in the nation’s hottest housing market. ‘P’ is for Pettygrove, named after Francis Pettygrove, who became one of the co-​found­ers of Portland after he bought out the half-claim of William Overton (see above) for only $50 in 1843. Five years later Petty­grove was one of the richest men in the Oregon Territory. It was Pettygrove who gave the new town its name by winning a coin toss. On the right is The Norm, a twelve-unit apartment built in 2012 at 1415 NW 19th Avenue. ‘Q’ is for Quimby, named after L.P.W. Quimby, who was one of the city’s early innkeepers and trucking business owners. He also served in the Oregon legislature and was the first state game warden. Pictured above, Sniff Dog Hotel, in the 1500 block of NW 19th Ave­nue, caters to our psychotic world with a doggie hotel, doggie daycare, doggie salon & spa, doggie training ... and Sniff Café for humans. ‘R’ is for Raleigh. According to Portland Names and Neighborhoods, this street was named after A.E. Raleigh, who was Deputy Su­per­in­tend­ent of Streets in the late 1800s, and whose boss was the person in charge of selecting new names in the Portland Street Renaming of 1891. But according to a 1921 article in the Oregonian, the street was named after Portland pioneer Patrick Raleigh. The photo to the above-right shows part of the historic (built 1891) St. Patrick Cath­olic Church in the 1600 block of NW 19th Avenue. In another photo of the church, I didn’t realize that there was a bird in the shot until after I had taken it. I do belive that it is my first picture ever of a bald eagle. To the right is a 100%-magnification crop — it’s kinda fuzzy and grainy, but it looks like a bald eagle to me. ‘S’ is for Savier, named after Thomas A. Savier, who owned a general store in town, and was a business partner of David Burnside (see above). To the right, a tiny piece of U.S. Route 30 to nowhere, which seems to be leftover from the proposed but canceled I-505. ‘T’ is for Thurman. Although there is some doubt about exactly which person this street is named after, G. William Thurman, the assistant manager of the Portland office of the Pacific Postal Tele­graph Cable Company, was a good friend of the man who was in charge of the Portland Street Renaming of 1891 — Douglas Taylor, the city superintendent of streets. On the right, two 15-by-25-foot flags, attached to 50-foot flagpoles, wave proudly on top of the main arch of the Fremont Bridge, which carries Interstate 405 and U.S. Route 30 over the Willamette River. ‘U’ is for Upshur. Another one of those handful of streets where there is a debate about who it is named after. According to Portland Names and Neighborhoods, it is named in honor of Abel Parker Upshur who, as U.S. Secretary of State in the 1840s, was a strong advocate of bring­ing the Oregon Country into the Union. According to a 1921 article in the Oregonian, the street was named for Rear Admiral John Henry Upshur, commander of the U.S. Navy Pacific Squadron, or his son, Custis Parke Upshur, a well-known (at that time) steamboat purser on runs between Astoria and Portland. To the right is the seven-story, historic (built 1895) Montgomery Ward warehouse at NW 18th Avenue and Upshur Street. Subsequent signs show that this building was used as a wholesale furniture store / warehouse and probably most recently, if legibility of the signs is any indication, Western Warehouse. Layers of paint ... layers of history. ‘V’ is for Vaughn, named after George Washington Vaughn, sixth mayor of Portland, hardware store owner, and business partner of Alexander Ankeny. From Alder Street to this point, I had been walking north on NW 19th Avenue, but it does not continue on to another cross street past Vaughn Street. Therefore, to finish the remaining letters of the alphabet, I needed to walk two long blocks west on Vaughn so I could continue north on NW 21st Avenue. Once I had arrived there, one of the first things I saw was this patriotic house at 2015 NW 21st Avenue. ‘W’ is for Wilson, named after Robert Bruce Wilson, who according to one biographer, “ was the first physician of distinguished ability and education in Portland.” He was also the son-in-law of John Couch (see above). In the photo to the right is industrial hardware on the corner of NW 21st Avenue and Wilson Street. ‘X’ is&hairsp; for&hairsp; ... Roosevelt? ‘X’ is for ... Roosevelt? Apparently, during the the Portland Street Renaming of 1891, nobody could think of a local pioneer or well-​known Portlander with a last name starting with ‘X’. One common street name beginning with ‘X’ is Xavier, but with a street called Savier (see above) already in existence five block south, that only would have led to confusion. So the powers that be probably made the right choice by skipping an ‘X’ name altogether, and naming the street, later in 1903, after president Theodore Roosevelt. To the right, the pretty-new, five-story New York industrial building on the southeast corner of NW 22nd Avenue and York Street. ‘Y’ is for York. Yet another one of those handful of streets where there is a debate about who it is named after. According to Portland Names and Neighborhoods, it might have been named after the city of York in England. Or perhaps after Portland candy and fruit store own­er Milton York. In a 1921 article in The Oregonian, they opined that the street was named after pioneer Methodist circuit rider John W. York. This explanation sounds good to me! To the right is a shot looking west along York Street from its intersection with NW 21st Avenue. ‘Z’ is&hairsp; for&hairsp; ... Reed? ‘Z’ is for ... Reed? Apparently, like the street name that was supposed to start with ‘X’ (see above), during the the Portland Street Renaming of 1891, nobody could think of a local pioneer or well-known Port­lander with a last name starting with ‘Z’ either. Besides, this street had already been named after Simeon Gannett Reed earlier in 1883, so there seemed little point in renaming it Zebra Street or some other word beginning with ‘Z’. Mr. Reed was a business partner with William S. Ladd, a co-founder and vice-president of the Oregon Steam Nav­i­ga­tion Company, and benefactor of Reed College. To the right is a Portland General Electric substation be­tween NW 21st & 22nd Avenues, and Reed Street & Sherlock Avenue. In the background is part of the historic (built 1910) Schoolhouse Electric & Supply building. Well, that brings us to the end of my pictorial ABC of Portland’s NW Alpha­bet District, but not to the end of my outing. On the return walk, I traversed the Alphabet District in reverse order — mostly on NW 23rd Avenue and then a bit of lower NW 21st Avenue near the end. Along the way I stopped for refreshment at four more McMenamins locations, making some good progress on my Mc­Men­a­mins Passport Adventure. But that is another story, which you can discover in Mc­Men­a­mins Portland Alphabet Dis­trict Pub Crawl. I’m very happy with how my project went. In one sense it wasn’t as hard as I had thought it would be, because there were more interesting subject to pho­to­graph along NW 19th and 21st Avenues than I had imagined. On the other hand, there were some blocks that were chal­leng­ing, but somehow I was able to meet that challenge and find photo-worthy subjects. From A to Z, I took 263 pictures. Ob­vi­ous­ly, I found more than one interesting subject per block! The best 94 photos are now on display in the new Portland Al­pha­bet District 2016 album. I am quite proud of how this article and album turned out. As far as I have been able to research, I think it is the most comprehensive exposition on the Alpha­bet District in existence on the entire Web! As you have seen, I relied heavily on the book Portland Names and Neigh­bor­hoods, as well as the series of ar­ti­cles on the history of Portland’s street names which were originally published in The Oregonian in 1921. I’m really glad I bought a copy of Port­land Names and Neighborhoods. Not only did it provide me with price­less in­for­ma­tion for this project, but the en­tire book is so interesting that I’m in the pro­cess of reading the whole thing from cov­er to cover. As you might have by now guessed, I love history! Roosevelt Street was indeed named for Teddy Roosevelt, who became president when McKinley was assassinated. He was elected in his own right in 1904, the year before the Lewis & Clark Exposition opened nearby in 1905. I believe York Street was named for York, the African-American slave best known for his participation in the Lewis and Clark Expedition. One hundred years later it would have been a fitting tribute. There's new information out there--for example, Burnside's first name was Dan, and York honors William Clark's slave (since 2002). Check out Harvey Kline's revised edition of "The ABCs of Portland's Alphabet and Pearl Districts".